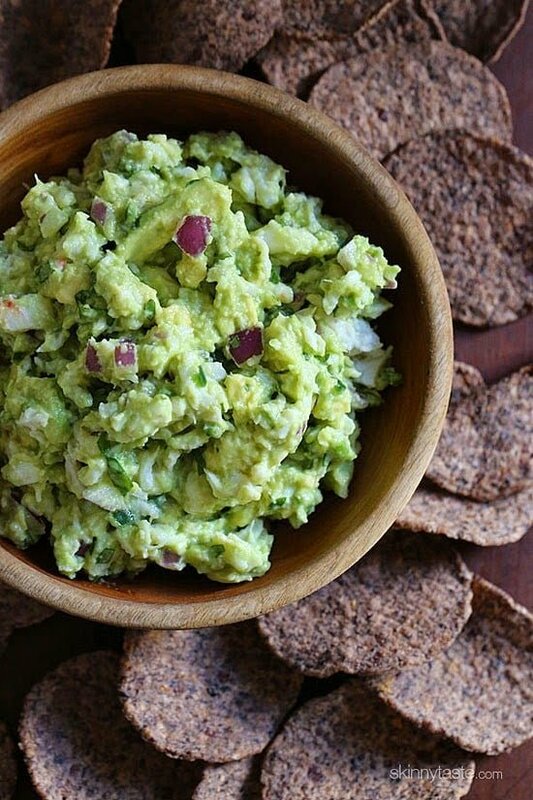 This easy crab guacamole is for the avocado obsessed! Perfect for any dinner or party app, I served them with Beanitos Black Bean chips which I love, but any baked chip would be perfect! We make guacamole a lot in my house, it’s one of the few ways I can get Madison to eat avocados. For a crab-less version, you can check out my Best Guacamole Recipe. You may also enjoy Guacamole Deviled Eggs or Breaded Chicken Cutlets with Deconstructed Guacamole. Ripe avocados feel soft under gentle palm pressure. (Don’t press them with your finger or they’ll bruise.) To speed ripening, place avocados in a closed paper bag at room temperature. Ripe ones can be refrigerated for several days. The trick is to a good guacamole is leave large chunks of avocado; don’t puree or mash them thoroughly. Having the perfect balance of lime juice, red onion and salt is essential. If you like it spicy, you can certainly add some diced jalapeño, some people also like to add diced tomato which is fine, but we like it just like this! In a medium bowl combine avocados, red onions, jalapeno, cilantro, lime juice, salt, and, if desired, hot pepper sauce. Cover surface with plastic wrap; chill until ready to use (up to 8 hours). Serve with tortilla chips.